Liberties Fun Run 2013 – Thank you! For the third year in a row the St. James’s Hospital Liberties Fun Run was won by Seán Hehir (17:55), while the women’s category was won by first-time entrant Orla Drumm (20:27). The fifth annual tour of the Liberties took place on Thursday, July 18th and it was a beautiful evening. 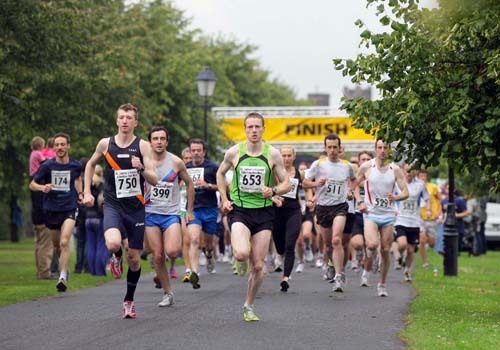 964 entrants included elite runners, runners, joggers, walkers, faithful supporters from previous years and first-timers. All feedback indicates that participants enjoyed the evening. Seán Hehir, a neighbour of the hospital from Kilmainham, a school teacher and a member of Rathfarnham AC, was the impressive winner with Phil Kilgallon in second place (19:25) and Colm O’Connell in third (19:35) both first-timers in this race. Orla Drumm, a doctor from Limerick and a member of Crusaders AC was the impressive winner of the women’s category; she beat world-champion Catherina McKiernan into second place (20:34) – also a first-time entrant – and Kate O’Neill, a sports therapist from Castleknock and Metro St Brigid’s AC into third place (20:51). Kate has been placed every year in this race; she won in 2009, was second in 2010, won again in 2011 and won again in 2012. First, second and third-placed athletes in both men’s and women’s categories won €200, €100 and €50 respectively, given by Diageo and Momentum Support. The race started and finished, courtesy of the Irish Museum of Modern Art, within the beautiful grounds of the Royal Hospital Kilmainham and the new 6 kilometre route this year took in a circuit of The Liberties that included James’s Street, St. James’s Gate, St. Catherine’s Church, Thomas Street, the National College of Art and Design, Francis Street, The Coombe and the Guinness Storehouse. The Fun Run was the result of generous contributions and co-operation from many organisations. It would have been impossible without the following four in particular: the Irish Museum of Modern Art at the Royal Hospital Kilmainham who hosted the event, sponsors Diageo and Momentum Support who provided the necessary funding and An Garda Siochána who helped to plan and who managed the race so graciously on the night. We are most grateful to the following also who were so generous with donations of product and services: Arthur’s for their post-race hospitality, ARUP, who provided the certifications for the timing clock and gantry, Chemistry Advertising who did the wonderful creative campaign for us, Dalcon Print who made our invaluable flyers and communications, FM104 who came and gave out treats at the start and finish lines – and charmed one and all as always, Global Taxis who provided transport for the publicity photocall, Seamus Griffin of Griffin’s Londis who provided the water for the participants at the finish, Hickey & Co who provided the safety pins, Manhattan who provided the popcorn for the winners, the Natural Medicine Company who gave the massage balm for the massages enjoyed at the end of the race and PML who donated the wonderful outdoor advertising campaign. The hospital is most grateful to the following statutory and voluntary agencies for their support in the planning and execution of this event: Dublin Bus, Dublin City Council, the HSE Ambulance Service, the HSE Emergency Service, Luas and the St John Ambulance Brigade. And thanks to the generosity of major sponsors, local companies Diageo and Momentum Support, all entry fees and all sponsorship raised will benefit the development of St. James’s Hospital. Until the next time; thank you again!